Learning more about various Deutschland words made Adolf very happy! Ze leader of Deutschland. Click here for more information. Highways of Deutschland. Adolf is known to put people in Volkswagen, "take them on Autobahn, und shoot them!" Hans argued that it would be much cheaper to simply shoot ze enemies rather than waste und volkswagen, but Adolf disagreed. As punishment, Hans had to live with Lebanpfoffen for ze week. Ze silent member of GMD. Click here for more information. While not technically und word of Deutschland, ze bull is central to GMD. Deutschland kidnapped the Spanish president und his bull several years ago. Ze president was promptly shot, und his bull kept. Since then, ze bull has become ze figure of strength und power. If something ist very good, it ist "Good like bull!" The tastiest, most fattening sausage available in Deutschland! Ze pet bird of Adolf! Picture is here! Ze newest addition to ze GMD crew! Click here for more information. France ist the mortal enemy of Adolf. It must be destroyed at all costs, und made fun of at even more cost. "Cause I'm kinda like und frenchman, always stroking mein French Stick." This ist an alleged meat product. It is good. Can be used as adjective: "Adolf ist good like Fritz!" Ze brains of GMD. Click here for more information. Ze host of Guten Morgen Deutschland! Click here for more information. Yes. Pronounced "Yarr". As in "Ja, Adolf ist good like fritz!" Ze previous ruler of Deutschland. He wore ze pointy hat, und always rode his horse, Noofenhoosen. Adolf did not like Kaiser. GMD's Village Idiot. Click here for more information. Ze air force of Deutschland. Used to attack France with. Ze muscle of GMD. Click here for more information. Zis is ze national fast food restaurant of Deutschland. My. As in "Mein Fuhrer has und first name, ist A-D-O-L-F!" Ze horse of Kaiser. After Adolf took power, Noofenhoosen was shot, fed to Lunkenhausen, und made into glue. Ze glue was then secretly fed to Lebanpfoffen. Ze army of Deutschland. Used to conquer France, und steal cheese from Switzerland. A Deutschland swear word, invented by Adolf. This, of course, is the great government/empire that Adolf leads! "If it's not Reich, then its not Right!" Also a Deutschland swear word, invented by Krauftenberg. What ze schnapperhausen is, ist completely und totally unknown. Ze identity of schnapperhausen is ze most pressing thing for Fuhrer, he must know what it is. Ze fact that Fuhrer does not know what schnapperhausen is, leads many to believe zat he did not invent it, like he says he did, but merely stole it, as Deutschland tradition dictates. But one thing is for sure, Deutschland could not be Deutschland without ze schnapperhausen. Ze word Schnapperhausen can be used in various forms, since nobody knows what it is. This ist most likely the same thing as Schnapperhausen, but nobody can tell for sure, since nobody knows what Schnapperhausen is. Ze world's largest Deutschland world. It took Krauftenberg 17 seconds to say in "Strong Like Bull". 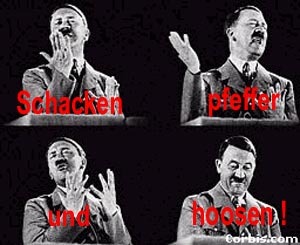 Zis word has nein meaning, it ist just really big. Deutschland's favourite (und only) breakfast cereal! Find out more here! Deutschland marijuana. Which Adolf stole from France. Ze only automobile allowed in Deutschland. Ze Volkswagen ist und important part of day-to-day life.